Most Texans are familiar with the Tax Free Weekend that happens a few weeks before school starts, but did you know there’s a new sales tax holiday for items that can help you prepare for emergencies and severe weather? 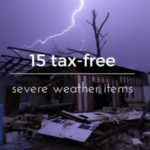 Texas Tax Free Weekend 2018 severe weather preparedness items list below. New this year, Texans will be able to stock-up on emergency preparation supplies and not have to pay taxes on the items the weekend of April 28th through 30th, 2018. The bill for the sales tax exemption was passed during last year’s legislative session. “We have two end caps full of batteries but we did order a lot more in preparation,” said Ace Hardware store manager Cary Palumbo as he walked the store in Wimberley. For the past year, Wimberley residents have been recovering after a massive flood swept through their small town. Trees remain pushed over on the river beds and homes are still being built. Wimberley resident Erin Cudd saw the effects of severe weather just this past week. “It almost sounded like a freight train,” Cudd said. Tuesday night, wind gusts up to 60 miles per hour tore through her property uprooting more than a dozen trees and destroying a shed. “I didn’t realize the damage that weather can cause, especially when it is unexpected. Making sure you have the right items that you need to be prepared for anytime that weather gets bad is just so important.” That’s exactly what this sales tax weekend is all about. First aid kits, hatchets and fuel containers are just a few items on the list, and in a time when people are still trying to rebuild, a tax cut is always welcomed. “I think everyone needs a little bit of help,” said Cudd.